A new study by Swiss researchers has found that seniors over age 65 who participated in a six-month music-based multi-task exercise program improved their gait, improved their balance, and experienced less falls and less risk of falling than a control group that did not participate in the musical exercise program. When the control group later participated in the same musical exercise program, they too realized the same benefits. The study, entitled “Effect of Music-Based Multitask Training on Gait, Balance, and Fall Risk in Elderly People,” was conducted by researchers, led by Andrea Trombetti, MD, at the University Hospitals and Faculty of Medicine of Geneva, Switzerland, and at the University Hospital and Medical Faculty of Basel University, Basel, Switzerland. It is published in the March 28, 2011 online issue of the Archives of Internal Medicine, one of the Journals of the American Medical Association. The researchers conducted a 12-month study of 134 community-dwelling adults older than 65 years, who were at increased risk of falling. They randomly assigned 66 of the participants to an “intervention” group and 68 of the participants to a control group. The intervention group participated in a six month exercise program set to music, while the control group were delayed by six months before their participation in the program. The musical exercise program involved various multitask exercises handling percussion instruments or balls, as well as basic exercises of walking in time to the music and responding to changes in the music’s rhythmic patterns. After six months, the study found that the participants in the first group who participated in these musical exercises had a significantly improved gait, with more steady and less uneven steps than those in the control group. They also experienced significantly improved balance, less falls, and less risk of falls, compared to the control group. Later, when the control group went through the same musical exercise program, they too were found to have experienced significantly improved gait and balance and less falls and risk of falling. The researchers indicate that additional research would be necessary to explain exactly how and why the musical exercise program achieved the measured improvements in gait and balance and lowered risk of falls that the study results showed. However, they speculate that various factors, including an increase in coordination and an increase in self-confidence resulting from the musical exercise, may help explain these findings. 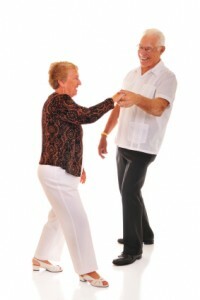 The results of this study are consistent with several other reports that have linked exercise, including ballroom dancing and other musical exercise, to health benefits in seniors. See e.g. A Better Lifestyle for a Longer Life. And, See, Let’s Dance to Health, by AARP.